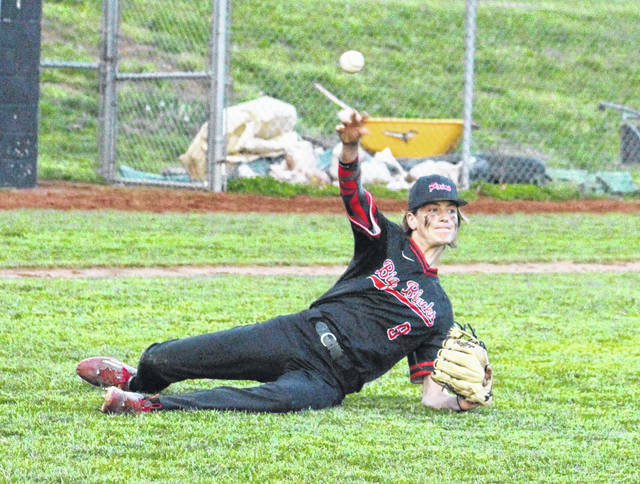 Point Pleasant sophomore Kyelar Morrow releases a throw to first after slipping while fielding a bunt attempt during Tuesday night’s game against Poca in Point Pleasant, W.Va.
POINT PLEASANT, W.Va. — A long climb to the top. 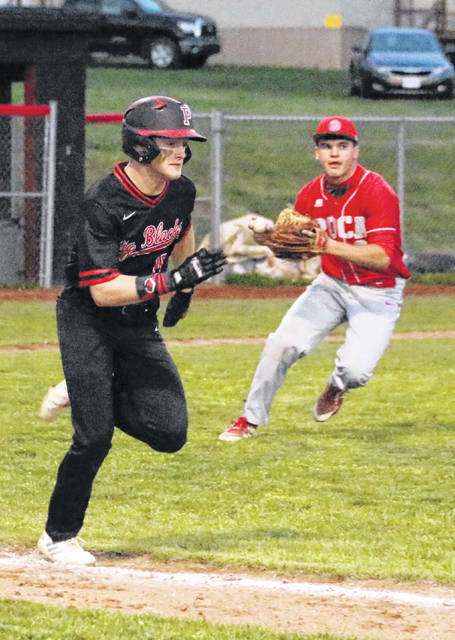 The Point Pleasant baseball team forced extra innings with a run in the seventh, then a Joel Beattie single capped a three-run bottom of the ninth in walk-off fashion Tuesday night during a 5-4 victory over visiting Poca in a non-conference matchup in Mason County. The host Big Blacks (13-5) never led in regulation and took their only lead of the game in the ninth as Beattie broke a four-all tie with a two-out bases-loaded single to left that plated Wyatt Wilson with the game-winning run. The Dots had broken a two-all tie in their half of the ninth as Cottrill doubled home Cook, then Cottrill scored on a single by McNeely that resulted in a 4-2 cushion. Kyelar Morrow, Tanner Mitchell and Wyatt Wilson started the home half of the ninth with three consecutive walks, then Miles Williams delivered a one-out single to center that allowed Morrow to come home for a 4-3 deficit. After an infield pop-up for the second out, Brody Jeffers drew a walk that allowed Mitchell to come home for a four-all contest. Beattie drilled an 0-2 offering down the left field line and allowed Wilson to score from third, completing the one-run triumph. Poca opened the game by scoring an unconventional run as Miller reached after being hit by a pitch, then stole second and used a pair of errors to get home for an early 1-0 edge. PPHS rallied to tie things in the second as Hunter Blain scored on a wild pitch with one out, tying the contest at one through two frames. The score remained that way until the top of the fifth as the Dots got a sacrifice fly to center from McNeely, allowing Payne to come home for a 2-1 advantage. 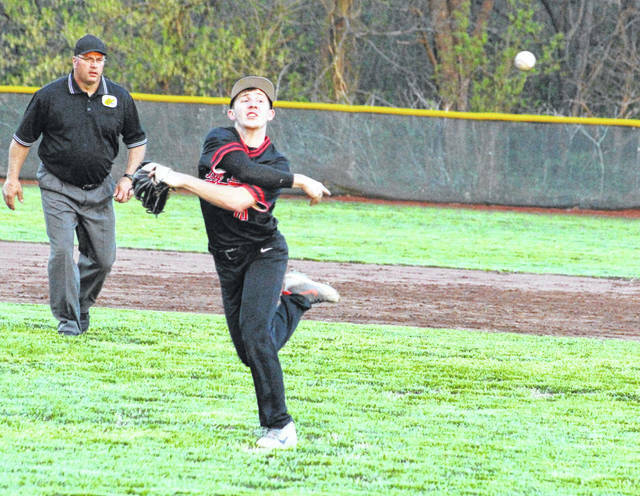 Poca outhit the hosts by a slim 9-8 overall margin and also committed three of the seven errors in the game. The Dots stranded a dozen runners on base, while the Big Blacks left only half as many on the bags. Carter Smith was the winning pitcher of record after allowing two earned runs and five hits over three innings of relief while striking out five. McNeely took the loss after surrendering three earned runs and three walks in the eighth without recording an out. Beattie led the hosts with three hits, with Williams, Jeffers, Blain, Morrow and Wilson also adding a safety apiece. Payne, Cook and McNeely paced the guests with two hits apiece, followed by Payne, Miller and Cottrill with a safety each. McNeely led PHS with a game-high two RBIs. Point Pleasant — which is now 7-1 in home contests — returns to action Thursday when it hosts Wayne in a non-conference matchup at 7 p.m.